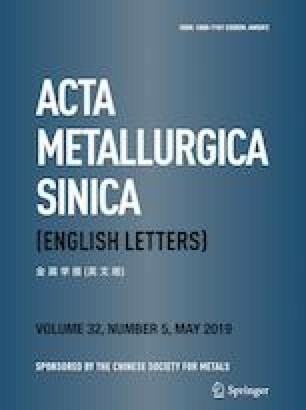 The microstructure and mechanical properties of the as-cast and heat-treated Mg–4.6Y–2.5Zn–0.6Zr–xSn (x = 0, 0.2 and 0.5 wt%) alloys were investigated in this work. The results showed that the eutectics have been refined with 0.2% Sn addition and it has no effect on the phase category of the alloys. However, Sn3Y5 phase was found in 0.5% Sn-added alloy. After heat treatment at 520 °C, the transformation of the long-period stacking ordered (LPSO) phase takes place in the Mg–Y–Zn–Zr alloy, but the transition is not completed in the alloys containing Sn. In addition, during the heat treatment, the mechanical properties of Sn-free alloys are significantly improved, and the strength of alloys containing Sn does not change much. Through observation and analysis of the microstructure and mechanical properties, it is found that Sn addition hinders the process of α′-Mg → α-Mg + 14H and the process is the key to the transition of 18H-LPSO to 14H-LPSO. This work is supported financially by the National Natural Science Foundation of China (Nos. 51774254, 51774253, 51701187, U1610123, 51674226, 51574207, and 51574206), the Science and Technology Major Project of Shanxi Province (No. MC2016-06), and the Shanxi Province Science Foundation for Youths (No. 201601D021062).